Sticking with our “March Monogram” theme, we’ve added a couple new note card designs to our collection. We always love an elegant script monogram but for many people, this may feel too formal for their style of letter writing. A card with custom printed initials is going to get much more use. Initials/monograms symbols have been used for centuries, dating back to 350 BC. Early monograms consisted of just two initials. Around the 17th Century, it became more common to use the three letters. In the early 1600’s, Rembrandt signed his early paintings with “R” or “RH” but later added a third initial (and eventually moved on to signing his name). British Royals use the 2 letters and these are intertwined to form a cipher, which is a monogram design for the reigning sovereign. In the Victorian era, monograms were associated with the aristocracy and therefore, were perceived as a sign of prestige. 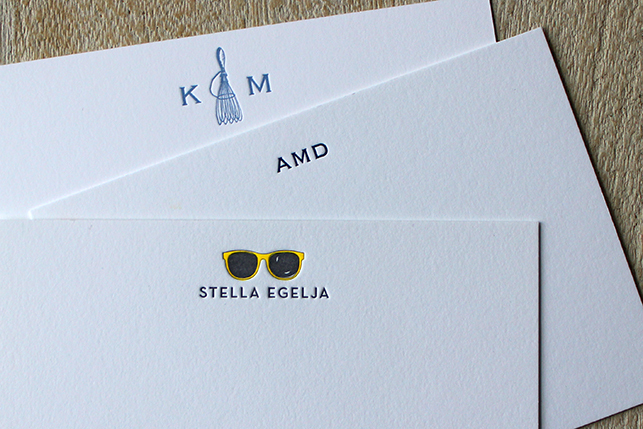 If initials feel too minimalist, a small illustration can be added to personalize the stationery a bit more. Here are a couple we’ve printed and love this month! The article expresses everything we feel as stationers! Handwriting is such a physical reminder of a person and email just can’t capture this. The average American household receives just 10 pieces of personal mail per year. This makes getting a note in the mail even more meaningful and taking the time to write and send a note feels good too. The Times article also notes that David Sedaris, one of our favorite writers, sends handwritten thank you notes. How cute are these custom notecards? Its never too early to get your children started with hadn't written thank you notes. We love the bright pink ink paired with adorable imagery of a kitten and girl with a rabbit. These custom note cards were a wonderful gift for a chic lady! We love the simplicity of the monogram printed in rich black ink. Just though we could share some photos of some recent stationery! These sets feel very cool with their blue on blue color palette. We're also adding wax seals to our finishing options, in case you're feeling like you need another special touch to your letterpress stationery. 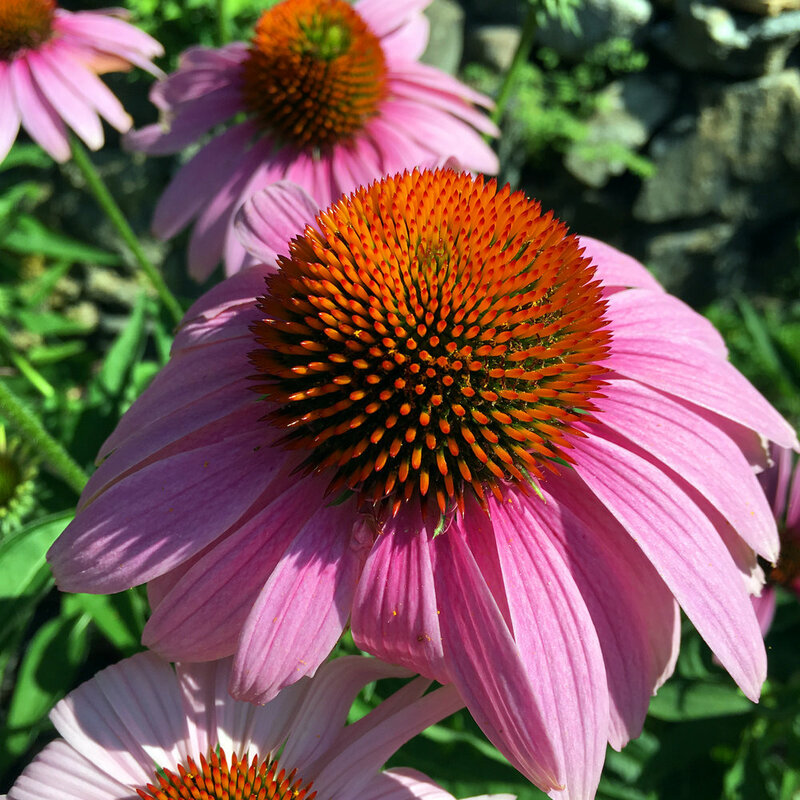 I've fallen in love with the echinacea plants in my garden this summer. The colors are crazy bright and they're always surrounded by butterflies and bees and the occasional bird. I've lost a lot of time this summer just watching. Unfortunately, they're starting to fade but to pay homage to this plant, we've created a new greeting card to add to our garden line. Here's a "behind the scenes" peak into the printing process at our studio. These monogram heart & arrow notecards are a sweet way to thank all your wedding guests for their love and support. A bespoke monogram paired with an image that symbolizes a couple's relationship is a great way to customize letterpress stationery. We're debuting these beautiful new note cards on our website this summer. The Branches stationery set features a pretty floral wreath with a custom monogram printed inside. We love the bright green ink on these cards, contrasted with the brilliant white paper. It creates such a lovely, and summery feeling. These note cards would be a wonderful gift for a new bride, celebrating her shower or even anyone with a summer birthday! For more photos and information, check them out on our website here. We have some cute new greeting cards this summer! These two small notes are both great thank you cards to send to any party host or even as your post baby or bridal shower notes. 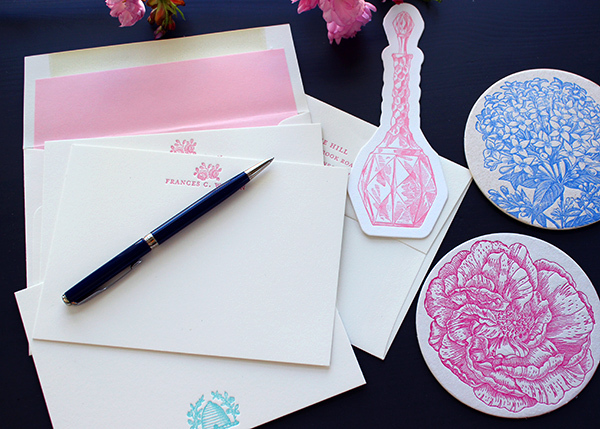 The bright pink strawberry and blue ship in a bottle are both hand letterpressed onto bright white paper and come with a matching blank envelope. You can pick them up from our online shop here! 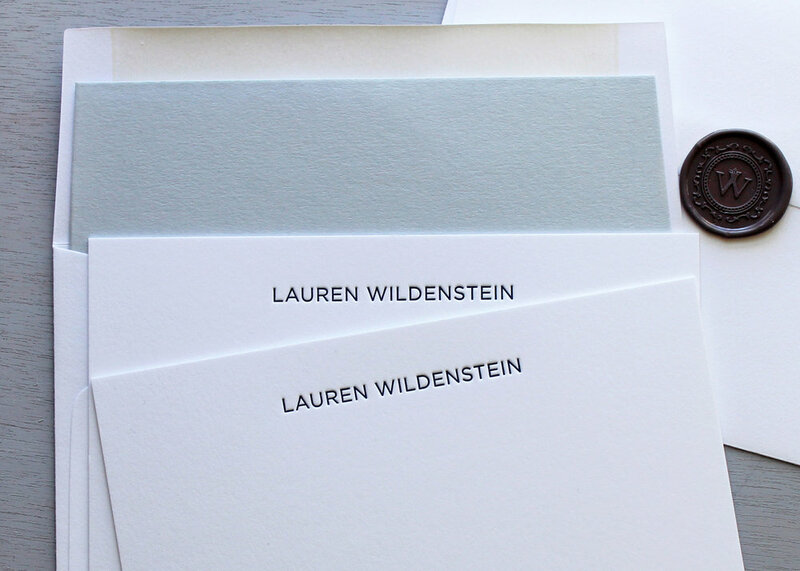 With the end of school here, letterpress stationery is a must have for graduates. A cute monogram or a fun illustration is a great way to say thanks with a bit of style. We're loving these yellow sunglasses notecards because they're bright and cheerful, and have us looking forward to some fun in the sun. Nothing cooler than some shades to say thanks! Valentine's Day is almost upon us once again! This year, we gathered a few of our favorite floral greeting cards and are selling them as a set. You'll receive 8 cards (2 of each design) as well as blank envelopes. Its a unique take on that Valentine's Day floral bouquet - and one that is great gift for your letter writing sweetheart. Pick one up exclusively in our online shop! Here's a whole slew of custom letterpress notecards we've printed recently. 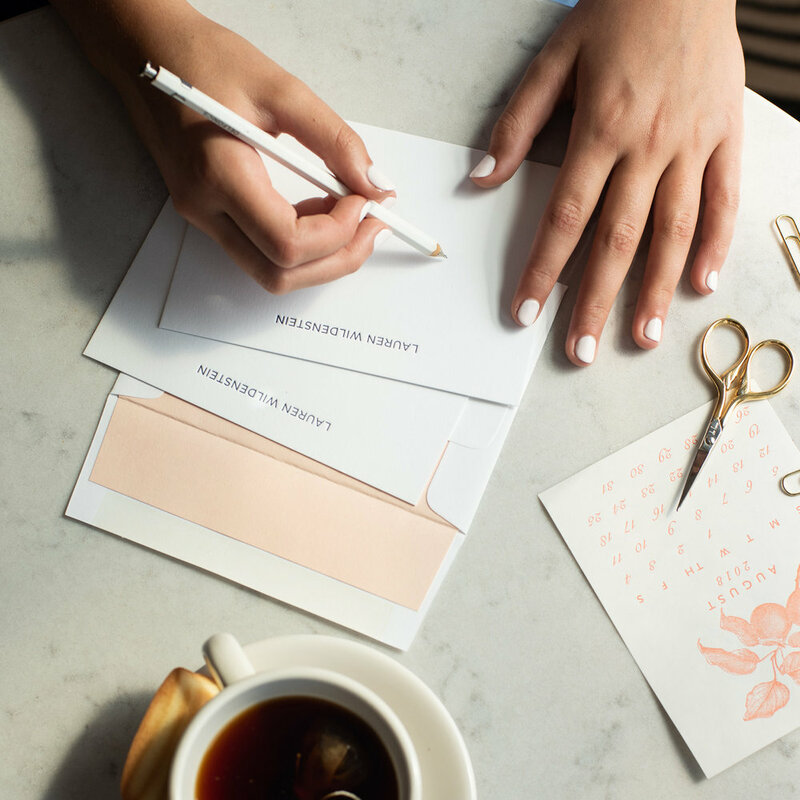 All this stationery is making us want to sit down and pen some nice notes. 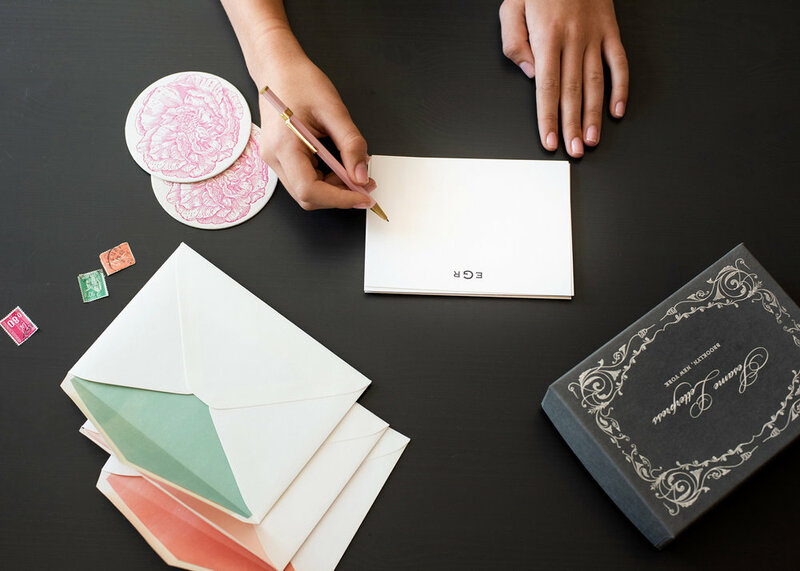 Each of these notecards features a couple names or initials and some illustration that complements them. The New York themed notecards are especially fun, since they feature landmarks of our fair city. These lovely note cards were letterpress printed in slate blue and paired with bright pink lined envelopes. The arrow detail on top of the names is simple, but sweet. Note cards like these are perfect for sending thank yous, after your engagement party, bridal shower or wedding. It's almost that time of year to thank your dad for all he has done for you! Let him know that he rules the roost with one of red rooster father's day cards. We love this letterpress card featuring the proud bird, showing off his black and red feathers. Order one from our site now, so you have plenty of time to craft the perfect message. If you're looking for a special gift for your dad, check out Hudson Made for some great grooming products. They have presents for the bearded or clean shaven dad, like their Cedar Clove Beard & Shave Soap. Your father's face will never feel more pampered. We've got bees on the brain! We printed these lovely little bees in black on mini manila tags. They were wrapped up with black and white baker's twine around gifts of honey. A nice extra touch to an already thoughtful gift. These bee coasters are part of our Butterflies & Bug coaster sets, available on our site. They're such a bright sunny color, you can't help but smile when you see them. 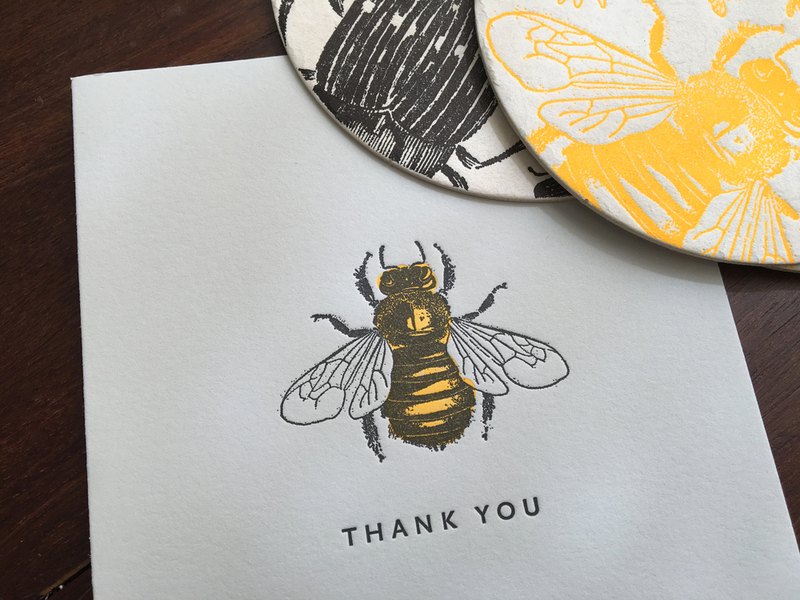 The Bee Thank You card is part of our Gray Gardens Card Set, also available online. It comes with 7 other nature inspired letterpress cards, all printed in neon colors. 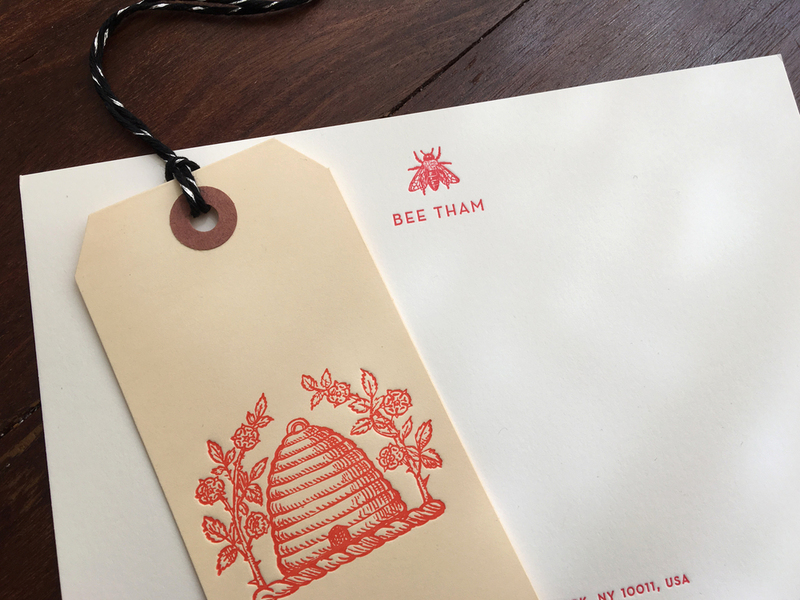 This custom bee stationery is very sweet, and no image could be more fitting for the name! The little bee looks great printed in red ink.